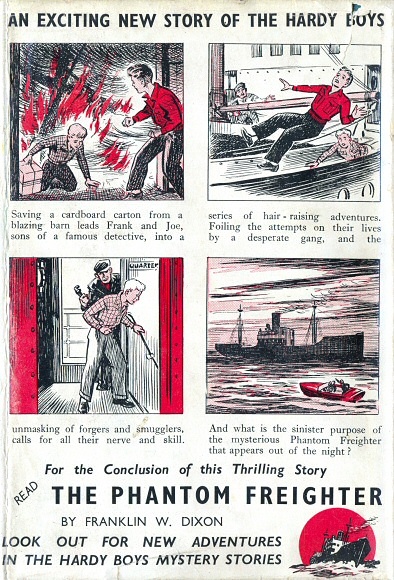 arold Hill & Son Limited, family owned book publishers, located at 62 Northumberland Street (later Killingworth Place in Gallowgate) in the North Eastern town of Newcastle-Upon-Tyne, was incorporated on the 19th of March 1947, and later successfully obtained agreement from Grosset & Dunlap to publish the Hardy Boys in the UK. 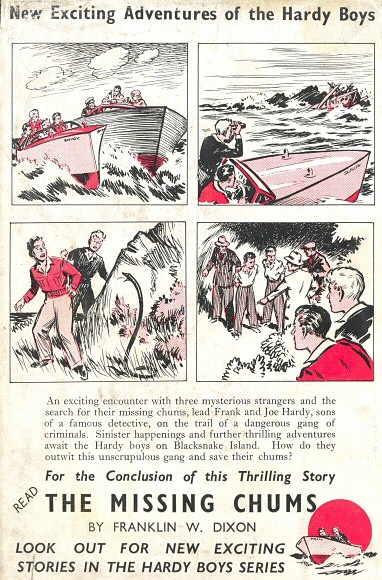 In January 1950 Grosset & Dunlap published their 29th Hardy Boys adventure in the United States: The Secret of the Lost Tunnel. 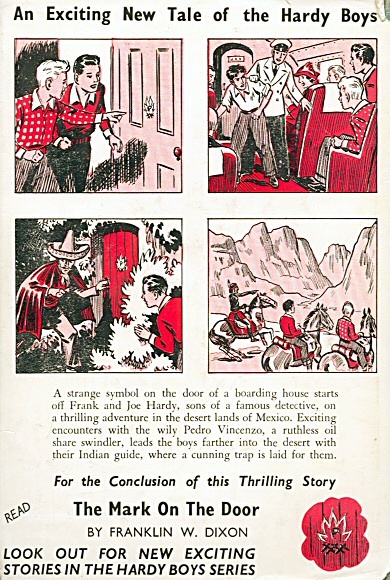 In December the same year, Harold Hill released a UK edition of Lost Tunnel at the princely sum of 6 shillings. 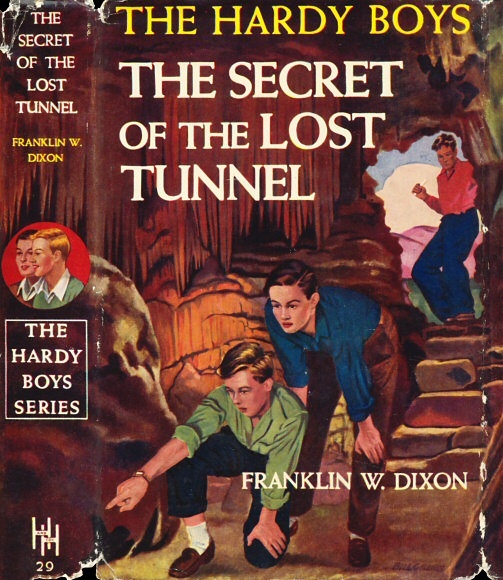 From 1950 to 1957, Harold Hill published 17 Hardy Boys titles in total – plus a different edition of their first title, Lost Tunnel. 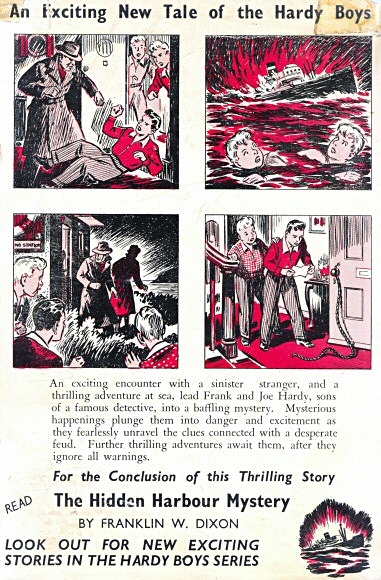 Harold Hill continued publishing for several more decades, and went into liquidation in the late 1980s. 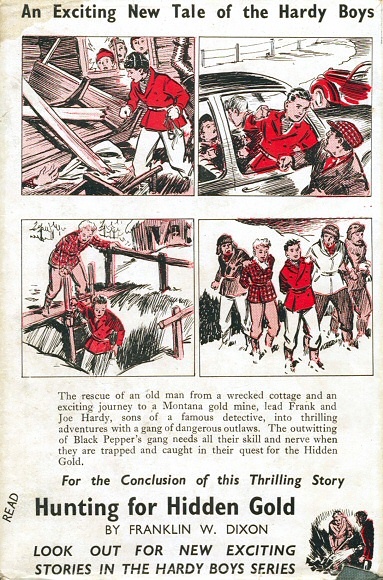 The Harold Hill editions were printed by Northumberland Press Limited, based in Gateshead-on-Tyne. 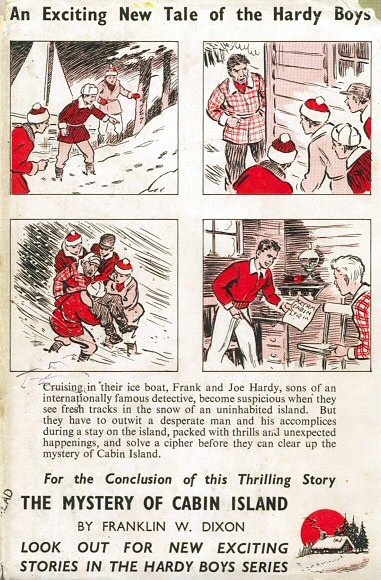 They featured the black silhouette of the boys on the front cover boards and the red/orange 'tree' endpapers drawn by J Clemens Gretta that featured on the Grosset & Dunlap editions. 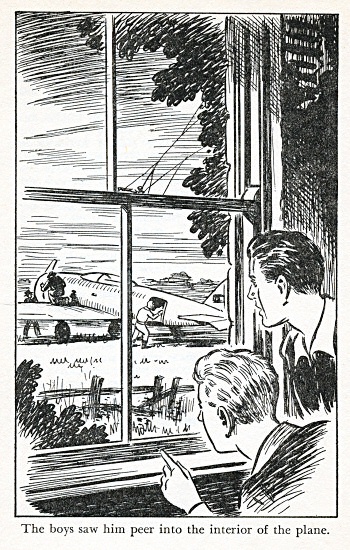 In most cases the frontispieces were taken from the American editions; however, in three instances – The Great Airport Mystery, The Hidden Harbour Mystery & The Mark on the Door – a brand new illustration by cover artist Frank Varty was used instead. 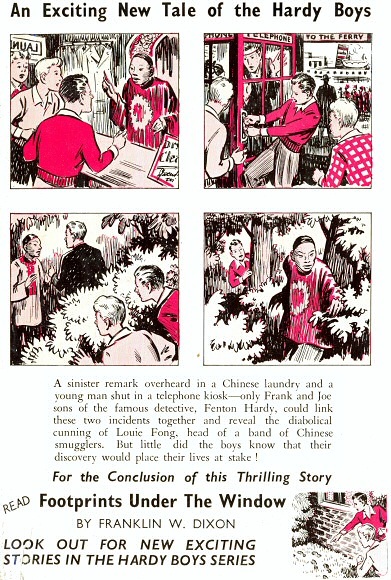 LEFT: The three 'new' Harold Hill frontispieces by Frank Varty. 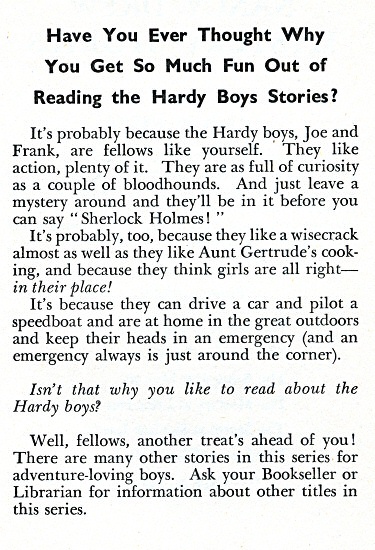 RIGHT: Internal advert for the Harold Hill editions. 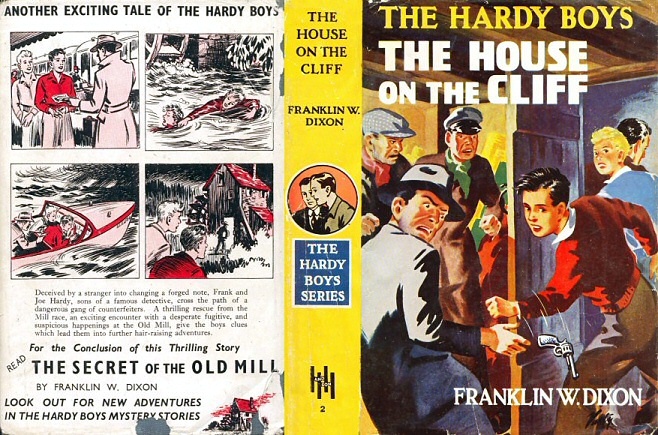 The cloth bindings of the Harold Hill books were blue for the 1950 and 1951 printings. 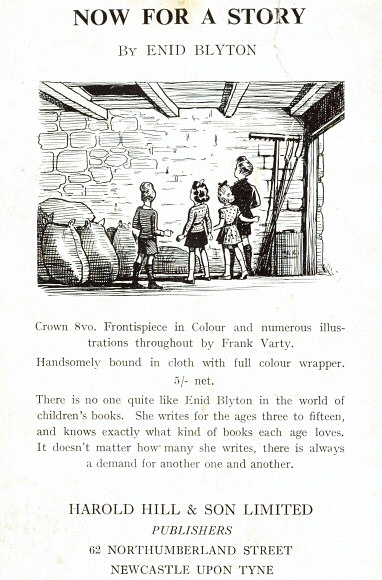 For all later books and subsequent reprints, a variety of colours were used, including brown, red, tan, cream, light blue, green, orange and yellow. 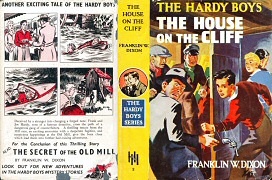 The orange boards that omit the Harold Hill name on the spine were introduced for reprints of What Happened At Midnight and all subsequent titles. 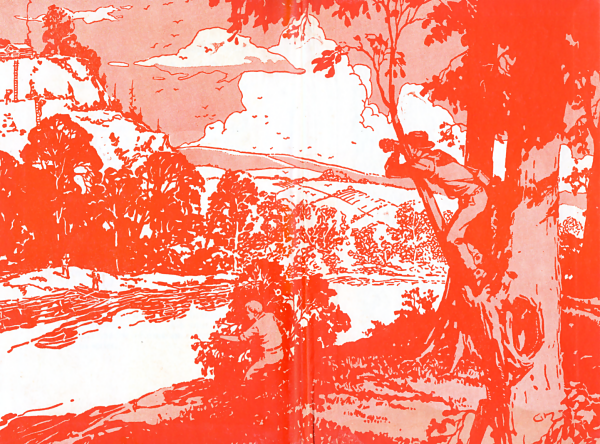 In an interview with Harold Hill's son, collector Sean Bourke found out that these particular editions were produced by another printer, hence the omission (thanks to Paul Mular for this information). 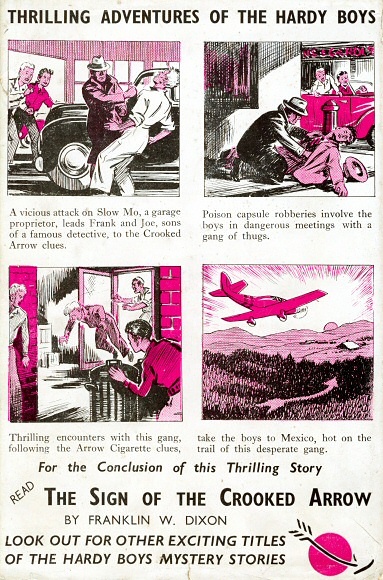 A selection of Harold Hill board colours. 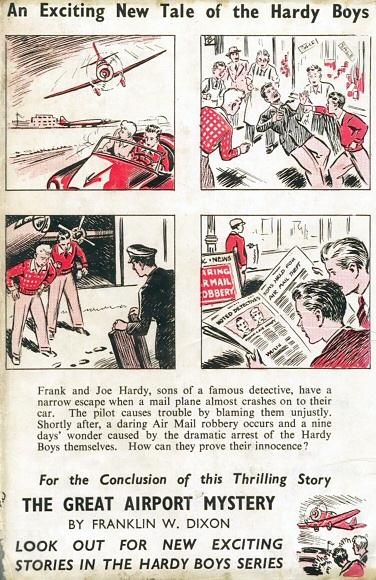 LEFT: Harold Hill advert from circa 1953 (courtesy of Paul Mular). 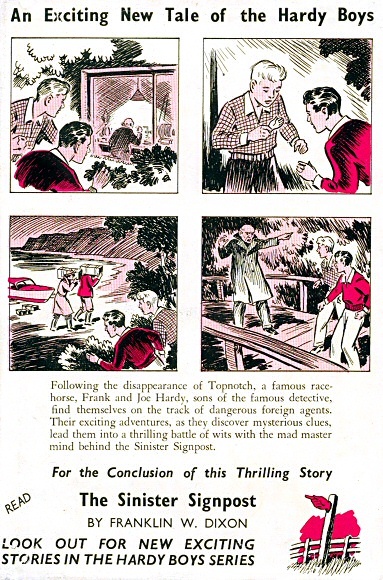 RIGHT: Advert taken from a Nancy Drew dust-jacket flap, circa 1954. 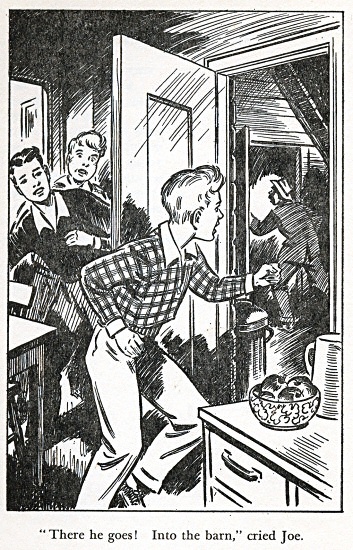 The texts of the books were Anglicised (e.g. harbor changed to harbour, color to colour, hood to bonnet, etc). 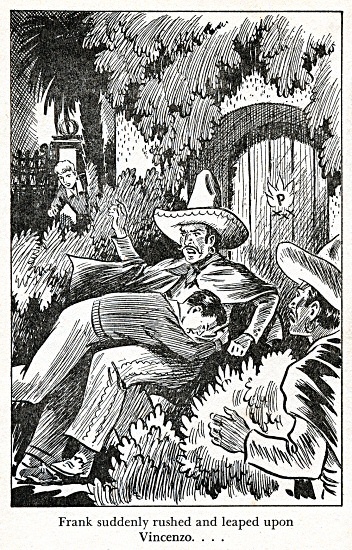 This meant that the texts were typeset from scratch, and therefore these editions are quite different to the American editions in many regards. 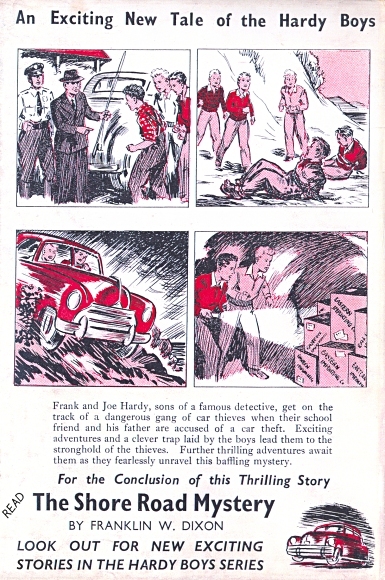 The dust jackets on the first three Harold Hill editions used the same cover artwork as on the American editions. 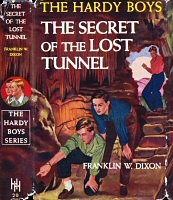 The Secret of the Lost Tunnel was the first of only two UK editions that had full wrap-around covers. 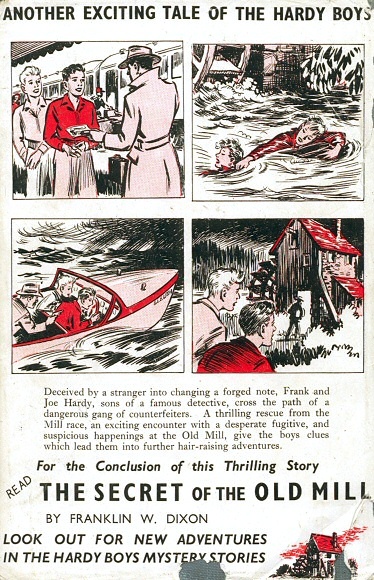 (A wrap-around jacket features part of the cover art continued onto the spine – The Sinister Sign Post as published by Sampson Low is the other example.) 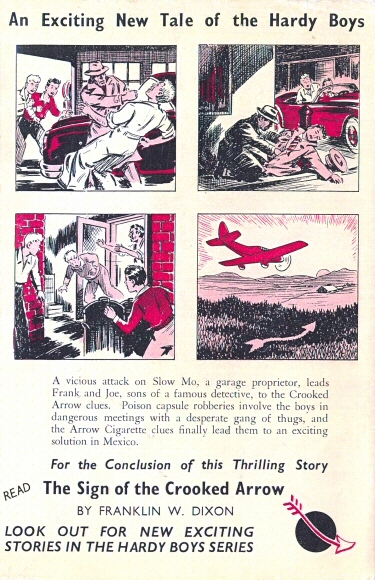 The next two books featured the American cover artwork, but with the wrap-around now replaced by a yellow spine. 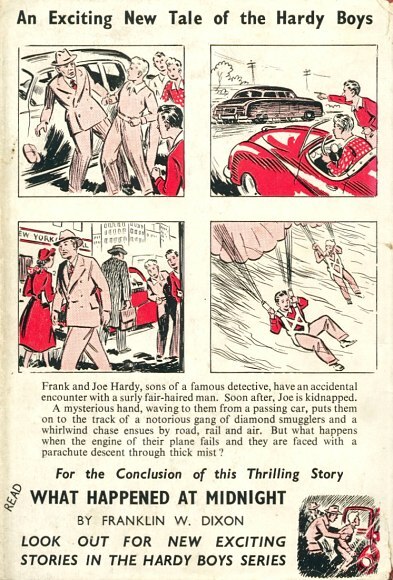 Around May 1951, the fourth Harold Hill title was released. 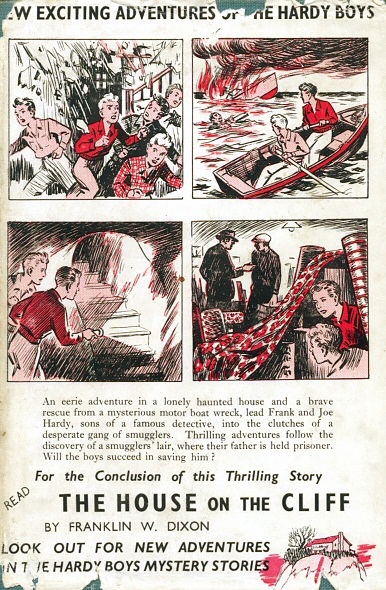 But The Tower Treasure, and all subsequent Harold Hill titles, featured new cover artwork by Frank Varty, a prolific British artist who also illustrated many books by other publishers, as well as Collins. 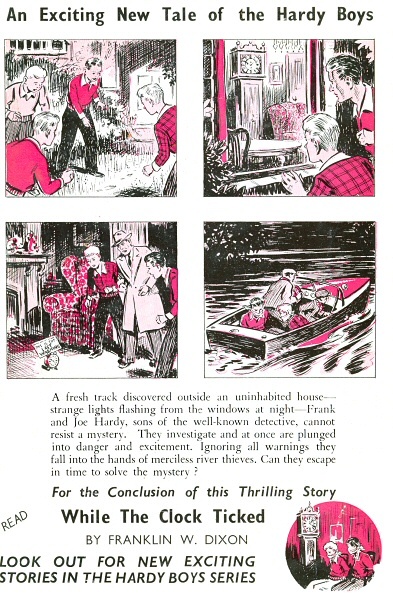 Varty would paint 15 covers into total, including the later reprint of Lost Tunnel. 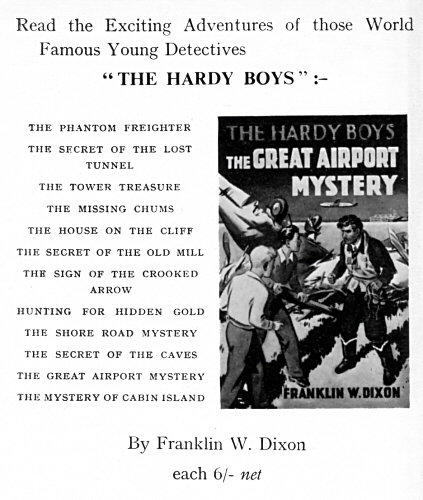 The following table lists all of the Harold Hill editions in chronological order, with the first column recording the dates found on the copyright pages of these books. Please note that the BNB publication dates are presented exactly as they are listed in the British National Bibliography, hence the specific layout of the brackets. 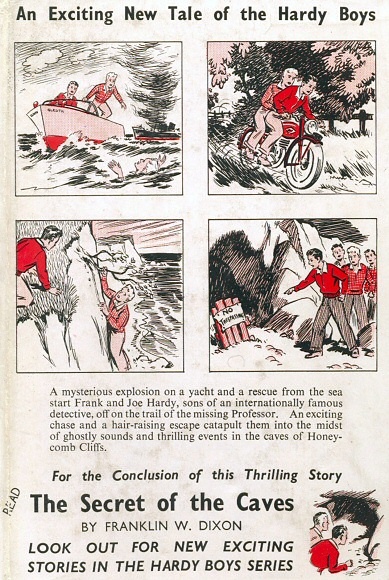 Note: BNB dates for The Tower Treasure and The House on the Cliff appear to be in error and probably refer to when the titles were deposited at the British Museum rather than genuine publication dates.